Technology & Partners — FrontEdge Inc.
As a Microsoft© Certified Partner, FrontEdge Inc. has the expertise to employ cutting edge technologies and resources to improve your business. 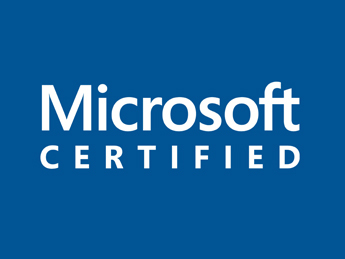 Microsoft Certified partners provide Microsoft services on behalf of Microsoft worldwide, spanning many fields including software providers and technical support. FrontEdge Inc. engineers and services staff have 24-hour access to Microsoft Support, which enables us to give better customer relations and support to customers. FrontEdge Inc.'s usage of primarily Microsoft© technologies for software/web development and hosted infrastructure maintenance is not limiting. FrontEdge Inc. delivers web-based solutions accessible to all customers and their patrons regardless of platform. Customers using Windows OS, Apple OS X, iOS, Android, and popular web-browsers like Google Chrome, Firefox, Internet Explorer, Safari, and Opera can all access and benefit from FrontEdge Inc. solutions. In order to provide the best service at the best price possible, FrontEdge Inc. sometimes partners with specialty focused companies that can provide heightened skill, experience, and additional labor to address particularly complex, time consuming, laborious, or delicate customer projects. Whether or not partners are leveraged to perform tasks for a customer for a given project, FrontEdge Inc. project managers plan, direct, and conclude all projects so that customers do not have to coordinate numerous consultants. FrontEdge Inc. also periodically sub-contracts to other service providers who are acting as "primary" project facilitators. In sub-contract situations FrontEdge Inc. typically perform specialty software development/web application development and IT infrastructure design and optimization services. If you are a service provider interested in sub-outsourcing a portion of your specialty work, please do not hesitate to contact FrontEdge Inc.